El Parque del Capricho (Capricho Park) is located in the Alamedia de Osuna neighborhood, in the Northwest of Madrid, right next to Juan Carlos I park. 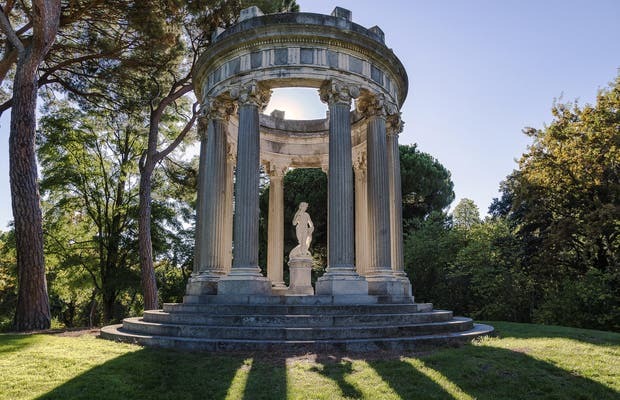 It’s the most unknown of all Madrid’s parks, despite being the only Romantic garden in Madrid. It’s a very beautiful and remote park, which explains its limited visiting hours, which are reduced to weekends and holidays. It is prohibited to enter the park with food, drink, pets, bicycles, etc. (park entrance is controlled by turnstiles). It’s an absolute delight to visit this park, as it’s so isolated, pure and gorgeous. The plant life is abundant and is perfectly maintained, thanks to the army of gardeners that work there. Among the many exemplary attractions, my favorites are the trees of love, whose leaves form a heart. One of the loveliest spots in the city of Madrid, an area that used to be the Duke of Osuna's. An authentic whim (as the name Capricho indicates) at the time in the surroundings of Madrid. It was designed by the French landscape architect Jean Baptiste Mulot and is located next to Juan Carlos I, somewhat under urban pressure now, it is still a real luxury to visit it. A place worth it in any season of the year. The time of most splendor is Autumn, but it is good anytime. There are some restrictions to get in and check the opening hours. Everyone who does not know this wonderful place will be surprised by this exquisite place full of spots for leisure, with the very extensive variety of flowers and some small but lovely lakes. The other day I had the opportunity to visit the marvelous historic 18th century gardens. It’s a lovely garden where you can find many interesting architectural works like the Casino del Baile (Dance Casino), the beehive, etc. In the garden, you can find a bunker that provided shelter many years ago during the Spanish Civil War. Unfortunately, you can’t enter the bunker, but from what I’ve heard, it has meters and meters of underground tunnels. At first glance, it seems like a completely natural garden, with no hint of man-made structures. The upper part has a beautiful lake which you can access by a wharf, also known as the Casa de la Cañas because it’s completely covered in reeds. The park was constructed almost entirely by the distinguished gardener Pablo Boutelou towards the end of the 19th century, under the orders of the Dutchess Doña María Josefa. This park, the jewel of all gardens in Madrid, is located in Alameda de Osuna, very close to Juan Carlos I park (Subway El Capricho, line 5). It is an impressive garden. Not known for its size, as it’s not nearly the biggest park in Madrid (14 hectares), but for its beauty. Construction of the park began in 1787, as an order of the Duchess of Osuna’s will, and was finished in 1893. The architect in charge of its design was the Frenchman Jean Baptiste Mulot. The Alameda was bought in 1920 by the Baüer family, who maintained the garden in good condition until they sold it at the end of the Civil War. From then on, the building was left abandoned until the town hall of Madrid took control of it in 1974 and began renovations a few years later.